Our Department consists of 23 School Buses, 16 home to school/school to home routes (which includes special needs), and a staff of 18 employees (plus sub drivers). On a normal school day, our school buses transport approximately 600 students (am/pm). 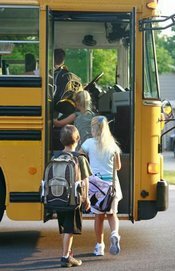 Our school buses travel an average of 170,000 home to school / school to home miles per year. In addition, they also travel 27,000 miles per year on school field trips and athletic events. Our office is open from 6:30 a.m. to 3:15 p.m. on Mondays and 6:30 a.m. to 4:15 Tuesday through Friday, except holidays. Our department concentrates on safety as our number one priority. We have an excellent safety record. For more information or questions about our department or the services we provide you may contact us at the Transportation Department (Bus Garage). AM Bus Route information for the 2018-2019 school year can been seen on the "Bus Route Information" link on the left side of this page. Afternoon bus run times should be the same as last year, with a reminder that on Mondays, both schools will dismiss approx. 1 hour early. there will still be 2 bus runs on Monday afternoons. They will both run 1 hour earlier than the rest of the weekdays. When we do run Snow Routes, it will be for both the AM & PM routes that day. If you need more specific information regarding the bus routes, please contact the transportation office phone # listed above.